Maharastra Security Force released a new recruitment circular for total 1500 vacancies. Maharastra govt jobs aspirant who searching Security Force vacancy in this state can check this vacancy details. Freejobalert Service providing you with some essential eligibility criteria and condition for this Maha Jobs. ►Maharastra Security Force Corporation released the notification for 1000 Male and 500 female force fill up. Security Force 1500 Candidates who want to participate in this Security For treatment, the participant should be 10+02 exam qualified from a recognised board. The age of the candidates should be 18 to 28 years as on 30th September 2018. upper age shall be relaxable for the reserved candidates. ♦To participate in this recruitment, all candidates have to pay Rs 300. Written exam and PST. physical Standard: Physical standard and ability will be checked for in this recruitment by Maharashtra Security Force Corporation. last date to apply: Candidates who will eligible and interested to participate in this Security Force Recruitment, the participant should have completed online application submission on or before 30th September 2018. You have to pay application charges through banks. 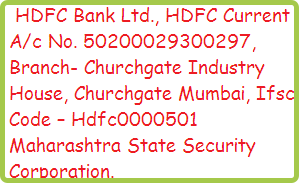 The bank details are provided below in the image. Official Notification: now, providing you with the official notification and website to apply. Carefully all details in the official website and apply. ►Do you need more Sarkari Naukri details then, you may check following Job alerts for participating.